Warning! This is NOT a movie review. This is a critique of the film. Intended to initiate a dialogue, the following analysis explores various aspects of the film and may contain spoilers. Views are my own and elaborate on comments that were originally tweeted in real time from the back row of a movie theater @BackRoweReviews. For concerns over objectionable content, please first refer to one of the many parental movie guide websites. Ratings are based on a four star system. Happy reading! While waiting to watch Incredibles 2, I detected an insidious pattern in the previews. For The Lego Movie 2, Wyldstyle (Elizabeth Banks) admits that she almost singlehandedly saved the world in the first movie, but that Emmet (Chris Pratt) took all the credit. The next trailer was for Wreck-It Ralph 2. In a telling scene, Vanellope (Sarah Silverman) stumbles into a room full of Disney princesses who initially question her right to join them until they identify with her plight; people always assume that all of Vanellope’s problems will be solved as soon as a big, strong man shows up. When the feature presentation finally started, I thought for sure the anti-male bias was over—surely Pixar wouldn’t stoop to such shameless sexism, right? Wrong. It would appear that the sentiments behind the #MeToo and #TimesUp movements have now infiltrated kids’ movies…and that makes me mad. For a detailed diatribe of my stance against movies that seek to indoctrinate children with partisan political views, read my review of Happy Feet. Suffice it to say, unhealthy stereotypes of men are everywhere now, even in typically high-quality, high class Pixar pics. Case in point is Bob Parr/Mr. Incredible (Craig T. Nelson). If we thought Bob was emasculated at the beginning of first film as the deskbound, pencil pushing cube dweller, imagine how worthless he feels when his wife Helen Parr/Elastigirl (Holly Hunter) gets a crime fighting gig and he’s left at home to raise the kids Mr. Mom style. 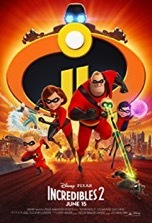 When Bob’s efforts to take care of his three kids go up in smoke (as a former accountant, he can’t even teach his son math because it’s “new math”), he reaches out to friend Frozone (Samuel L Jackson) for advice and prevails upon costume designer Edna (Brad Bird) to babysit Jack-Jack. Particularly disturbing is the cost analysis scene, which flags Mr. Incredible as an extreme insurance risk. The analytics reveal that Elastigirl (woman) completes her missions without bending a blade of grass, while Mr. Incredible (man) inflicts massive damage while attempting to defeat villains. Men are characterized as blundering buffoons who just can’t help but destroy everything in their path (much like Wreck-It Ralph or Hulk). So then, if Bob is a failure as a father and a superhero, what good is he? The last player in the NFL draft is referred to as Mr. Irrelevant. In I2, Bob Parr isn’t Mr. Incredible, he’s Mr. Irrelevant. Bob is the exemplar of the scores of men who’ve been sidelined and debased. Will it get to the point where men are nothing more than laborers and lovers in a matriarchal society, as was depicted in Gene Roddenberry’s Planet Earth (1974)? Time and societal evolution will tell, but as for now, we’re on the verge of the systematic censure, deconstruction and endangerment of the male of the species. Aside from gender roles, the movie also gets political when it deals with the integration of the Supers back into society; a topic that could relate to refugees from the Middle East, illegals pouring over the border from Mexico or even the way the LGBT community is being assimilated into the broader populace. The movie also makes thinly-veiled commentary about our growing screen obsession. Staring at one of villain Screenslaver’s hypnotic patterns can override a person’s will and make them highly susceptible to committing evil acts. Walk into any public place and you’ll see people with their faces buried in screens, in essence hypnotized by onscreen content and completely oblivious to what’s going on around them. The parallel is obvious; the solution isn’t. It’s ironic that this problem was in its initial stages when The Incredibles was released in 2004. Despite its broad spectrum of commentary, the film does have some fun, although not nearly as much as the original. Even though the scenes with Jack-Jack are the highlight of the film, the tyke is given far too many superpowers and the various applications of those powers are way overplayed, usually to generate laughs. Syndrome (Jason Lee) is a far superior antagonist to Screenslaver, whose identity is obvious from the start. There are several new characters here including: salesman Winston Deavor (Bob Odenkirk), inventor Evelyn Deavor (Catherine Keener), Voyd (Sophia Bush), Krushauer (Phil LaMarr), Reflux (Paul Eiding), Rick Dicker (Jonathan Banks) and Ambassador (Isabella Rosellini). As with the first movie, Brad Bird wrote and directed I2. So is I2 worth the wait (14 years)? It pains me to say that I2 fails to capture the first film’s unbridled creativity and off-the-wall exhilaration…and fun. Though I2 is entertaining, it certainly isn’t incredible.